Fruit at Hawaii Tropical Botanical Garden, Hawaii. July 16, 2012. Habitat: It grows mainly in the cooler, arid sections of central Brazil, where it is found in barren ground. Description: Ananas nanus (Dwarf) is a delightful little pineapple grown mainly as ornamental rather than an edible. 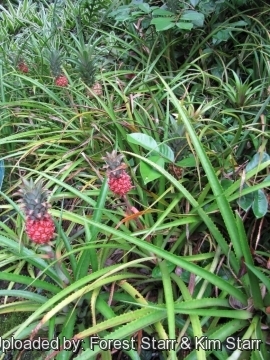 It is a pygmy relative of Ananas ananassoides cultivated for it´s pink inflorescence, that lately becomes a beautiful miniature yellowish pineapple. 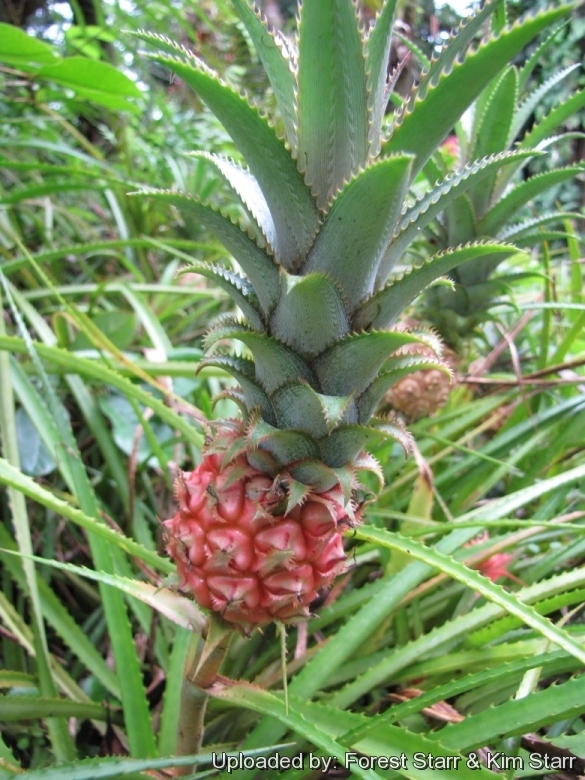 The miniature pineapple's small fruit is edible. It can be bought in fruit in a 10cm pot! Rosette: Open, spider-like, about 30-60 cm tall, 40-60 cm wide (or a little more) of whorled dark green leaves. Leaves: Long, stiff , green-grey to dark-green often blushed in maroon in full sun, leathery with sharp spines that pierces the skin like curving swords. Unlike other bromeliads, the plant isn´t designed to store water in the middle of its leaves, although it has special hairs on the leaf surfaces that absorbs water, so watering the leaves is important. Inflorescence: Looks like a cone-shaped pineapple. It´s on the top of a 30-50 cm tall stalk from the center of the leaf rosette, also covered with those special hairs (it looks grey). The flowers are tubular, small, mauve-lavender to purple up to 5 cm long, and attracts birds. On the top of the pink inflorescence you have another whorl of leaves growing in there. Bloom Time: Spring, Late Spring. Healthy two-year old plants may just produce the first flowers! Fruit. The ripe fruit looks like a baby pineapple usually no larger than that of a chicken egg, (or a bit longer). The fruit changes its colour from pink to pale yellow at maturity. The fruit is capped with a small rosette of leaves, called a coma, that will take root in the soil after the fruit naturally decays and drops to the ground. It is juicy and tastes good, but it´s a little more acid than the regular pineapple, the epicarp is relatively thicker and covered with tiny spiny bracts that makes you need to use gloves or something to protect your hands, so many people just leave it. 1) Forest & Kim Starr “Ananas nanus (pink pineapple, dwarf pineapple)”. Plants of Hawaii. <http://www.starrenvironmental.com>. Downloaded on 20 August 2014. Cultivation and Propagation: Ananas nanus is an valuable miniature ornamental pineapple due to the beauty of the foliage and of the inflorescence, fruit and the facility of cultivation. It is more commonly grown as a house plant but seldom blooms indoors, so no fruit is produced. Growing substrate: It requires a well-drained, aerated, porous and moisture-retentive substratum which that has organic matter incorporated (e.g. 2 parts peat moss to 1 part loam to 1 part sand or perlite). Use only acidic to Neutral soil. Root rot can be a problem if the soil is too moist. Fertilizing: Fertilize every 4-week during the growing seson with a balanced fertilizer diluted to ½ the strength recommended on the label. Apply mild solutions (one-quartet strength) of foliar fertilizer at 3-month intervals to both garden and container plants. Pest & diseases: It is susceptible to scale and trips. Mealybugs infestations are also a frequent problem. Use: Use this bromeliad as a specimen in a frost-free garden border or patio container, or as a houseplant where not hardy. Ananas nanus is small enough for the windowsill. It is a valuable landscape plants that require very little care and create exotic tropical look. You can also use them in flower arrangements or even as exotic drink stirrers. The small fruit is edible, but its size makes it better as ornament than a snack. Propagation: Remove and replant stout offshoots from the base of the parent plant. After flowering and fruiting the plant dies, but not before at least one plantlet, a pup, grows from the mother plant's base as a replacement. The new rosette can be left there, since it will substitute the mother plant. It blooms repeatedly and as the small pineapple continues growing, some new buds are formed on the stalk at the base of the fruit. The crown and the buds of the inflorecence/fruit can be replanted. It may also be grown from seed: remove seeds from inﬂorescence and lay them uncovered on a bed of crushed tree fern fibre; keep constantly but moderately moist. Warning: Plant has thorns or sharp edges that deter some gardeners; use extreme caution when handling.